The incredible trial of an appallingly ordinary man. 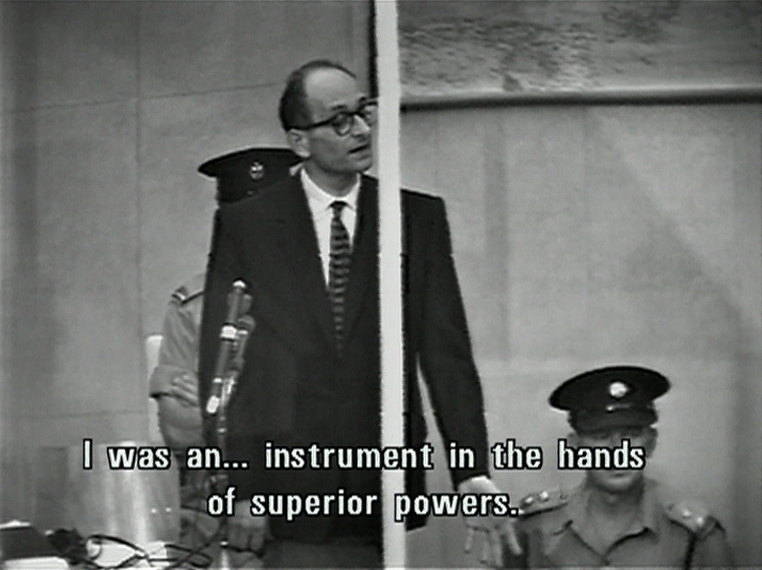 Drawn entirely on the 350 hours of rare footage recorded during the trial of Adolf Eichmann, in 1961, in Jerusalem, this film about obedience and responsibility is the portrait of an expert in problems resolving, a modern criminal. 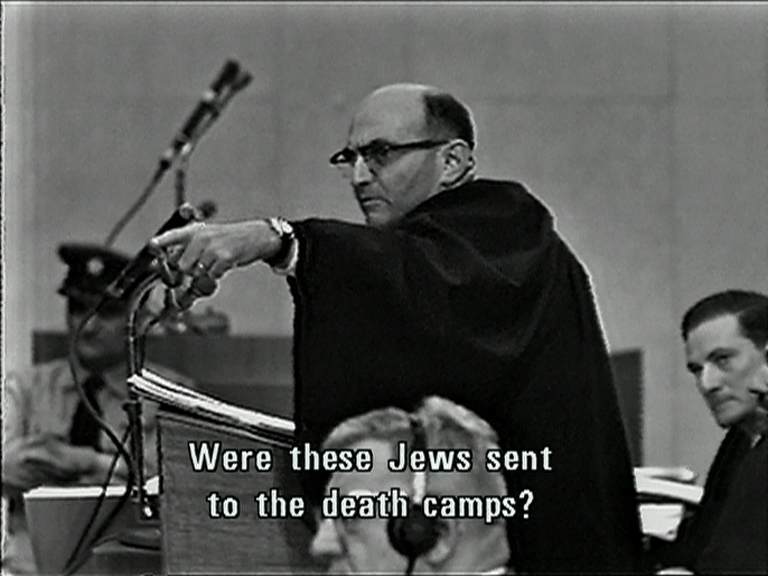 The film is inspired from the controversial book by Hannah Arendt : "Eichmann in Jerusalem, report on the banality of evil". "THE SPECIALIST" is a courtroom drama painting the portrait of a zealous bureaucrat who has immense respect for the Law and hierarchy, a police official responsible of the elimination of several million people, a modern criminal. The prosecution describes the accused as a blood-thirsty pervert, the Machiavellian liar and a serial-killer yet he appears as a quiet family man, both comic and terrifying in his banality. Although he doesn't deny the role he played in the criminal enterprise that he belonged to, he shelters behind the instructions of his superiors, his vow of allegiance and the obligation of obey orders. He considers that his role as a mere agent, a purely administrative and logistic one, devoid of all passion, shelters him from the justice of men, even through it may not exempt him from all responsibility. The accused, Adolf Eichmann, is a man of average height, in his fifties, shortsighted, nearly bald and wracked by nervous tics. Throughout his trial, he sits in a glass box, surrounded by neat piles of documents that he ceaselessly notes, re-reads and leafs through. An expert on emigration and specialist in the "Jewish issue", responsible for the transportation of "racial deportees" to the Nazis camps between 1941 and 1945, he describes his work with suffocating bureaucratic precision. Before the court and the witnesses who survived the hell that he consigned them to, he admits to having provided the death factories with human convoys for destruction. He struggles to show the conflict between his duty and his conscience and insists on the fact that no one can accuse him of having done his job badly. Intoxicated on the dizziness of his own powerlessness, the accused describes himself as "a drop in the ocean, an instrument in the hands of superior forces". If he hadn't done it, he says, someone else would have done it instead. The contrast between the monstrous nature of the crime and the mediocrity of the accused is immediately striking and becomes even more apparent during the thirteen scenes making up this documentary feature, revealing the portrait of a terrifyingly ordinary man. 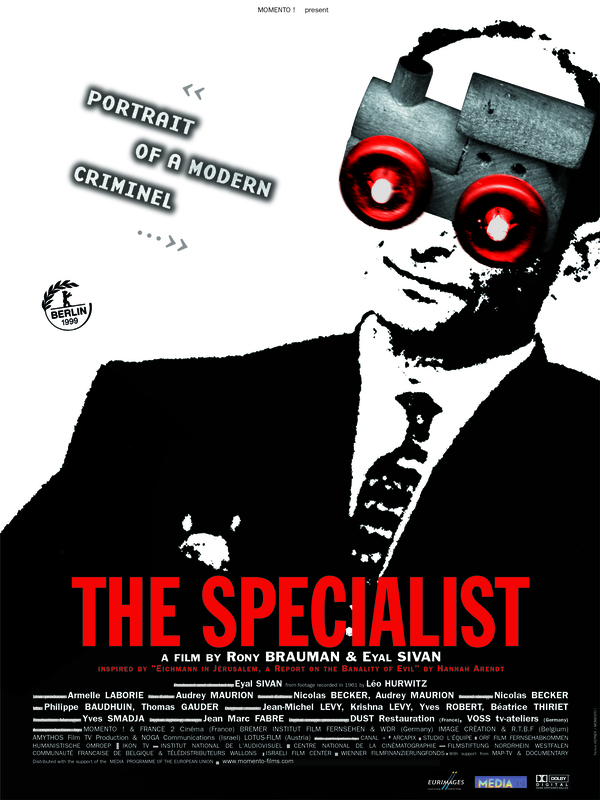 "THE SPECIALIST" is composed exclusively of the previously unseen 350 hours of footage recorded during the dramatic trial of the Nazi war criminal Adolf Eichmann, in Jerusalem in 1961. The setting is the main auditorium of the House of the People in Jerusalem, transformed into a courtroom for this occasion. Here, over more than eight months in 1961, the State of Israel judged the man who escaped the Nuremberg trials. The film takes place within these four walls. 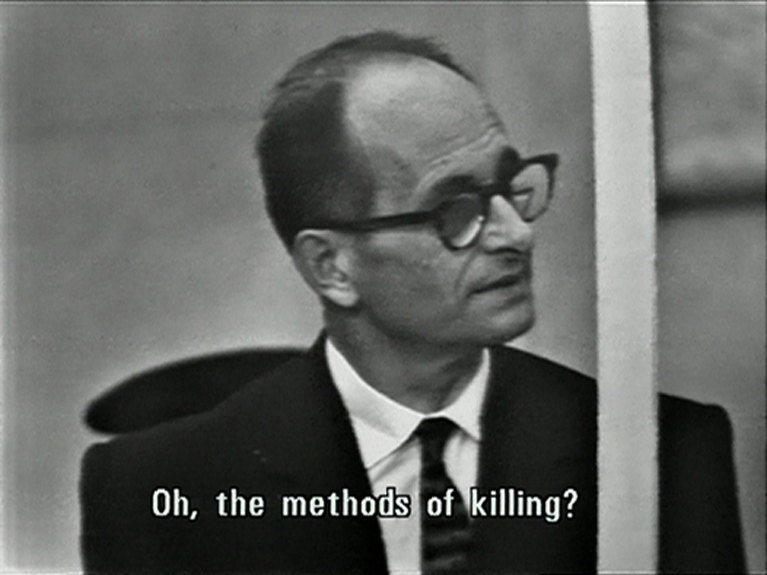 The accused, Adolf Eichmann, German, born in 1906 in Solingen, Germany. He joined the SS in Austria at the age of 26. Nine years later, in 1941, he was promoted to the rank of SS lieutenant colonel. Former head of the IV-B-4 bureau handling inner security of the Third Reich, he was in charge of the mass deportation of Jews, Poles, Slovenes and gypsies in Europe to the concentation and death camps. Following his capture in Buenos Aires by the Israeli secret service in 1960, he was tried in Jerusalem the following year, then hanged. Unanimously considered as responsible for the extermination of millions of people during the Second World War, he recognised that he was guilty of "terrible crimes" while denying the charges that the court brought against him. He is the main character in the film. The prosecutor, Giddeon Hausner, born in 1915. In his opening speech, that lasted three days, he presented himself as the voice of six million victims. Using anger and sarcasm with theatrical skill to confront of the accused, his rage would not diminish throughout the trial. In the name of the Israeli government, he led the prosecution's case against Eichmann and, through him, the whole Nazi movement. Assisted by Gabriel Bach and Ya'akov Bar-Or, he brought forward evidence for the fifteen counts of indictment against A. Eichmann: seven for crimes against humanity, four for crimes against the Jewish people and four others for war crimes and belonging to a criminal organisation. The Court. The trial was not undertaken by a special jurisdiction but by the Jerusalem District Court. Three Israeli judges of German origin presided. The Chairman, Moshé Landau, was an austere character. Throughout the trial, he continually strove to bring the prosecution back onto the legal terrain of Eichmann's own responsibility. He also used his own authority to demand "clear answers to precise questions" from the accused. Judge Benjamin Halévy seemed studious and precise. He unhesitatingly interrupted the procedure to obtain precise details from the witnesses and also acted as Eichmann's "confessor", speaking to him frequently in German. Judge Yitzhak Raveh was the oldest member of the court. He questioned the accused in German, in a debonair tone, obtaining cold and precise revelations in return. The dialogue between these two judges and Eichmann sheds precious light on the accused's role and methods. The defence lawyer, Robert Servatius, a lawyer from Cologne, was formerly an assistant at the Nuremberg trials. Hired by the accused, he was paid by the Israeli government. Overwhelmed by the scale of the charges against the accused, he remained a shadowy figure throughout the trial. The accused carried out his own defence. Filming. 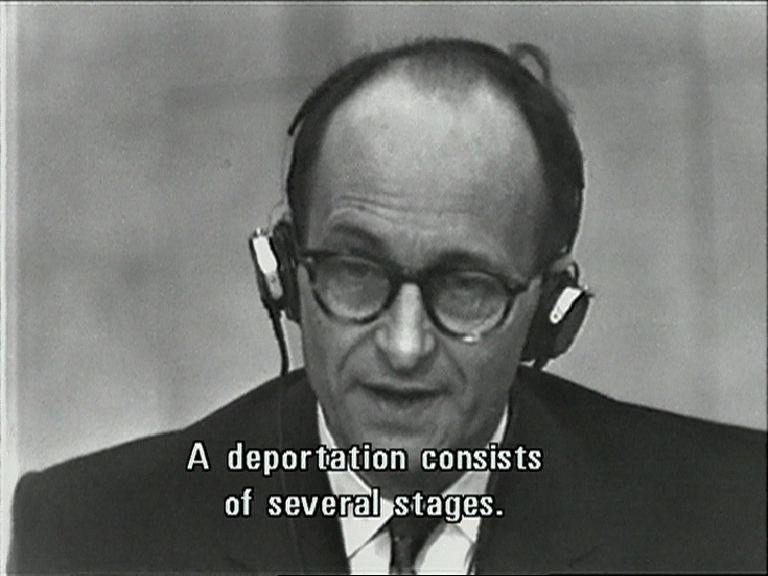 Deliberately designed as a spectacle, the Eichmann hearings are the only example of a Nazi criminal's trial filmed in its entirety. Four video cameras, concealed behind fake partitions in order not to disturb proceedings, were placed in the auditorium transformed into a courtroom. The footage from one of these four cameras, as well as the sound, was recorded by a revolutionary technique for the time: video. The American director Leo T. Hurwitz decided which of the four angles was recorded. Around 500 hours of the trial were recorded on 2-inch video-tape, in the NTSC standard. Part of this stock has vanished. The remaining 350 hours were conserved haphazardly and have had to be remastered and catalogued. The salvaged footage of the trial today forms a historic collection that is now available for consultation and use. The footage for "The Specialist" has been restored, regraded and transferred by computer onto 35-mm stock. It is made up entirely from these archives.